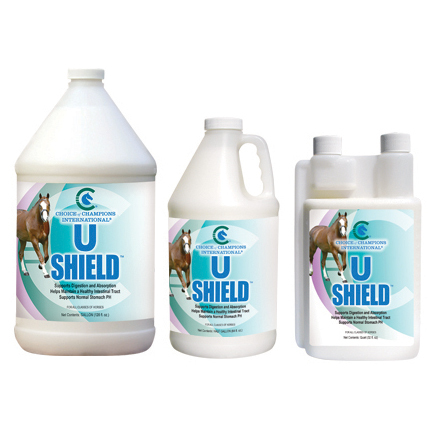 U SHIELD supports a horse's digestion and the absorption of ingredients. The quart bottle of U SHIELD has a self-measure cap. When purchasing the gallon or half gallon size of U SHIELD, a 1 ounce pump is included at no additional charge. U SHIELD also helps maintain a healthy intestinal tract and promotes normal pH. U SHIELD begins to work upon ingestion and can be administered directly into the horse’s mouth. Science has proven many training, performance and behavioral challenges are the consequence of stomach issues. Signs of stomach concerns may include poor appetite, lackluster condition, behavioral changes and declining performance. Sensitivity to the stomach area and annoyance when the girth is tightened may indicate stomach irritation. Stressors that may result in stomach irritation include moving to a new environment, daily training and competition. Add U SHIELD to your horse’s daily regime to promote shiny coat, healthy weight, appetite and calm temperament. Competition horses and youngsters in training are ideal candidates for U SHIELD. CHOICE OF CHAMPIONS products should be stored at 40-80 degrees Fahrenheit. Extreme hot and cold temperatures and direct sunlight may cause ingredient breakdown. When properly stored, U Shield has a shelf life of two years.